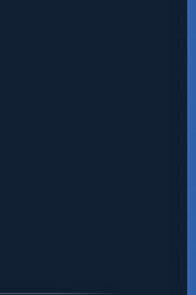 The minimal order for Ukraine is 0.5 l of luminescent paint for oracal. This paint can be shipped to any city in the World. Glow paint for self-adhesive film and ORACAL from Noxton is a luminescent paint that was specially designed for advertising agencies, designers, studios and creative groups. We created a paint that you can easily apply to the desired surfaces using a sprayer or a brush, with no need to use silk-screen printing. As the result of applying our self-luminous paint you get a glowing coating on a self-adhesive film or a luminescent oracal. The surface perfectly withstands the impact of environmental factors. Ingredients of the glowing paint: Self-luminous paint for self-adhesive film and ORACAL from Noxton is made with high quality polymer dispersion that has high adhesion and is prepared for mixing with a glowing component. Purpose of the glow paint: Self-adhesive film, ORACAL, stickers, labels, paper, polyethylene, oilcloth, banner and other similar surfaces. Properties of the luminescent paint: Applied to the surface luminescent paint has a whitish color (translucent) during the day. It glows green and light blue in the dark (see the other glow colors below). Glow duration of the paint (up to 8-12 hours) depends on the time and intensity of its exposure to the light source. Glow paint can be charged by any source of light: Sun, ordinary electric lamps, DRL, fluorescent lamps, ultraviolet, etc. Methods of applying the glow paint: Using a brush, roller or through a spraying method. Use of the glowing paint: The surface should be dry and clean. Dirt has to be removed mechanically; wash off the grease and dust from the surface. Before you apply the self-luminous paint TAT 33, you have to mix it thoroughly until homogeneous (compulsory condition). It is recommended to put 2-3 layers of paint. 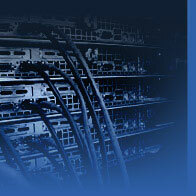 Drying time of each layer is about 2-3 hours at a temperature of +20°C. Consumption of the glowing paint: up to 11 m2 /l. in 1 layer (depends on the painting method). Recommendations: The highest glow intensity can be reached by applying the luminescent paint to a white surface. Darker surface absorbs more energy. So you can put some white primer before you start to paint. 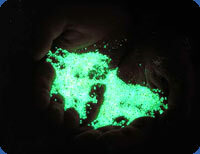 Glowing paint and human's health: Nonradioactive, nontoxic, nonflammable. Storage of the luminescent paint: Keep in a tightly sealed container at a temperature from -10°C to +40°C. Storage life of the luminescent paint is up to 200 years, thanks to "KeepSafe" technology*. Glow paint package sizes: 0.5 liters, 1 liter, 3liters, 5 liters, 10 liters. 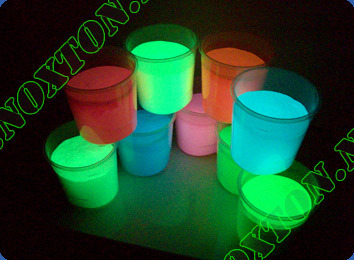 Self-luminous paint from Noxton has the best glow intensity and duration. Glowing paint is made of eco-friendly materials so it won't affect your health (unlike others). Glow paint is the same product as: luminescent paint, self-luminous paint, luminous paint, light-accumulative paint, glowing lacquer, self-luminous polish, luminous liquid, phosphor paint. glowing paint, buy luminous paint, glow in the dark paint, how to make luminous paint, glow paint price, where to buy glowing paint, glow in the dark paint made at home, glow paint for rims, glow in ultraviolet paint, luminous paint for body, glowing paint for wheels price, luminous luminophore paint, luminous tattoo ink, glowing paint made by yourself, luminous paint tat 33, glow paints sale, glowing paint production, glowing rims, glow paint composition, glowing paints production, luminescent paint, luminescent paint buy, luminescent paint price, where to buy luminescent paint, self-luminous paint, glow powder, luminescent paint, phosphor paint, light-accumulative paint, Noxton, new technologies, TAT 33.